History has taught us that things tend to have a habit of repeating themselves, be it due to human nature or a rule that governs existence why then can it not be true of the universe in general? We know a reasonable amount of what makes up our universe however there is still a considerable amount that we do not yet understand. We as a species do not accept that however and always seem to be seeking to further our understanding of the nature of things which is a good thing. We know that the life of the bodies in the universe have their own lifespans just as we humans do, stars begin their lives in dust as do the planets that orbit them, as stars get older they go through various stages of aging in which produces various other elements and effects in the area, in the end many explode scattering the elements that they held within throughout our universe thus seeding the basis of the elements that we know and also allowing new things to form from the resulting nebulae, dust and energy. Modern science has taught us that everything began from a single point and the birth of our universe took place with the “big bang” going forth billions of years to today towards the universe that we know as home. But what if like other forms of creation and life this was not the beginning of all things, but a continuation of a cycle of death and rebith? New discoveries and theories have been made in this area which I definately find interesting, we as a species have a habit of making the same mistakes, however we also have the potential and the capability to learn from our mistakes and grow / become something new. Could this also be true of our universe? Does it go through similar processes potentially leading to a “perfect state”. Think of what secrets the universe may have learnt in its evolution / death / rebirth and how these come to play in the future. At least it seems it has learnt how to bring itself back from the ashes of it’s extinction to begin life again. Certainly an interesting week for science. THE Big Bang might not have been the beginning of the Universe, but just the start of a new chapter. Scientists have found rings of radiation in the cosmos that may be older than the Big Bang, suggesting that event was just the latest in a series of rebirths, Wired reports. The theory was proposed by Sir Roger Penrose, a theoretical physicist at Oxford University, and Vahe Gurzadyan of the Yerevan Physics Institute in Armenia, in an article on arXiv.org. 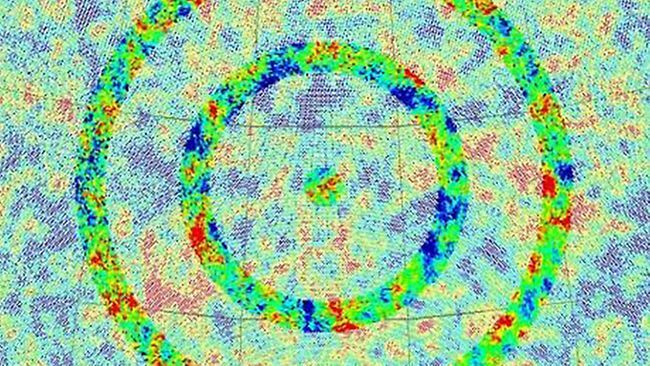 The circles of radiation appear in concentric circles made up of below average temperature in the cosmic microwave background (CMB), which is the leftover glow of the Big Bang. Whilst breakthroughs in science is always an awesome thing in my book, it’s the 21st century where is my flying car damn it! Quantum anything has typically fallen into our oft-used category of ‘awesome things that’ll never happen,’ but if a crew of researchers at the California Institute of Technology have anything to say about it, they’ll soon be changing the fortunes of that segment. The team has recently demonstrated quantum entanglement for a quantum state stored in four spatially distinct atomic memories, and while that probably just blew your mind a little bit, the breakdown is fairly interesting. Essentially, they’ve uncovered a quantum interface between the atomic memories, which is said to “represent something akin to a computer hard drive for entanglement.” If extended, it could pave the way toward quantum networks, and in turn, massive webs of quantum computers. We’re obviously decades out from understanding what this all means for the common computer user, but just remember this: “for an entangled quantum system, there exists no objective physical reality for the system’s properties.” And you thought The Matrix was deep. A few weeks back I remember reading how we were in the 490’s of discovered exoplanets with us creeping slowly towards the 500th mark. If I remember the article correctly it indicated that we were most likely to hit this milestone in the beginning of the new year, yet low and behold space.com announces the discovery of the 500th exoplanet. We certainly live in an interesting age of science and discovery, the 1800’s had the physical innovations that allowed us to develop mechanical tools to make our lives easier the industrial revolution. The 1900’s was a further expansion of this and the introduction of electronics allowing us to develop tools instrumental in further studies of the theoretical / classical sciences. It seems that the 2000’s is going to further build on the “space age” discoveries of the latter half of the last century in the fields of astronomy, astrophysics and general understanding of the way that things work and our place in the universe. However all this discovery of alien worlds and the potentially habitable one it makes you realise that no matter how far that we have come we still have a very long way to go before we can even think of stepping upon a world that orbits another star. As a world we have the potential to achieve great things, have our own “space empire” in our solar system with our current levels of technology and resources coupled with the human pioneer drive however as much as I think it would be awesome to see, I would be surprised if it does happen within the next 10 years due to the fragmentary nature of our species, so much power and potential but diluted there is only so much we can accomplish without true pooling of resources and knowledge. That aside, I would like us to focus on developing more efficient means of space travel, even for within our own solar system, however the only thing that gives me pause with this aside from my desire to see it happen is the fact that technology used in these purposes could also be used for military based applications, and given our nature would we be more likely to use it to settle the solar system, or blow the crap out of our neighbour?